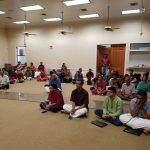 Sri Poornimaji conducted a satsang at the Hindu Temple of San Antonio located in San Antonio, TX (about 200 miles west of Houston, TX) on Friday, April 20. The satsang began at around 7:15 pm with kirtans of Sri Swamiji that speak of Nama Mahima. This was followed by a wonderful discourse by Sri Poornimaji on the Greatness of the Nama Sankirtan. She first spoke about surrender to the Lord, what it really means, and how true surrender is really very difficult. Nevertheless, Mahans show us a simple way to attain that highest state of surrender through Nama sankirtan. 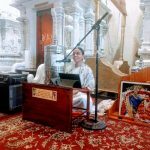 She exhorted everyone to chant the Mahamantra at least a few times everyday, like a “vrata” (fast). It may seem hard at first, but over time the Name itself will cleanse our hearts and bring in enjoyment of the chanting, and finally and steadily lead us to complete surrender. 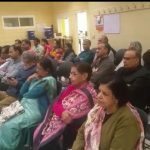 The program at the temple was organized by Smt. 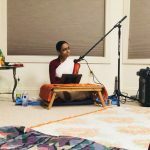 Aparna Padmanabhan, who also leads the weekly San Antonio GOD satsang. The next morning, Saturday Apr 21, Nama was chanted for 1 hour from 11:30 to 12:30 at the residence of Smt. Aparna and Sri Vaidyji. This chanting was also part of Seattle GOD’s 12-hour Akhanda Nama sankirtan, via telephone. 2 Responses to "San Antonio Satsangs"
I live here in San Antonio, TX. Please provide me the local volunteer contact information. 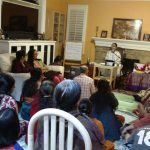 Radhe Radhe Mahesh ji… San Antonio Satsangs are coordinated by Aparnaji. You can email her at ydaparna@yahoo.com to get more info. You can call me at 832-515-1251 if addl info is needed. (I live in Houston).